pups4sale testimonial: Your site is great. I have used it a few times now and I always have to take the ad out after a couple of weeks, because the pups are sold and people are still enquiring. Beautiful Mini Daschund Puppy - Smooth Coat - 4 months. We have two beautiful cavalier's available for sale. Pups are purebreds and both parents are on view. Pups are well socialised. Pups come fully vaccinated, wormed and microchipped. Beautiful fluffy Maltese puppies looking for their forever home. 1 boy & 1 girl remaining Raised in a loving family environment. Vaccinated, Microchipped & Wormed. Make the right choice for your family. 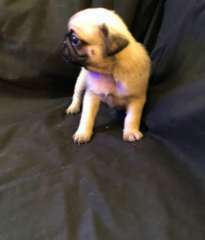 Pups4Sale is an online dog directory connecting reputable breeders and rescue organisations with people looking to open their homes to a new family member. Covering a broad range of breeds and with dogs of every age, it's never been simpler to find a furry friend who fits into your lifestyle. Being an online business, we can connect buyers and vendors wherever they happen to be. Whether 'youre a breeder in Perth or looking to make a forever friend in Melbourne, we're the site for you. Take a look at our listings today and find your next family member on Pups4Sale! We're dedicated to improving the state of the dog breeding industry, so we ensure that every listing on our site is genuine. With some of the strictest vetting for vendors in the industry, you can rest assured that you're only looking at genuine offers for puppies and dogs for sale - no scammers! It's part of our dedication to our customers and to Australia's animals. Find precisely the pet you're looking for with help from Pups4Sale. Filter by breed, age and point of origin and ensure that you're getting a friend you'll love for life. Take a look at our listings today and discover how easy it could be to find your ideal dog. Looking to share the joy of your latest litter? Sign up today and start creating listings within minutes!